We can’t talk about the Nigerian Labour Law without talking about the National Industrial Court. The National Industrial Court of Nigeria is a special court that has been set up to specifically deal with labour matters. It was originally established in 1976 by the Trade Dispute Act, CAP 432 Laws of the Federation of Nigeria 2004. It was later made a superior court and vested with exclusive jurisdiction on labour matters by virtue of the Third Alteration Act, 2011. As the court currently sits amongst the Superior Courts of the country in Section 6 (5) (cc) of the Constitution of Federal Republic of Nigeria 1999 (as amended), its popularity has skyrocketed in view of the volume of cases which the court deals with round the year. So also, employees now feel a sense of safety knowing there is a specialized court where labour matters can be speedily dispensed with and justice handed to them in the face of tyrant employers. Employers alike have tend to adjust their policies that seem laborious and uncaring in how employees are treated for the fear of being slammed with lawsuits. The foregoing notwithstanding, this piece of literature is to further enlighten employers and employees on their relationship and the position of the law in that regard and give a proper understanding of the Nigeria labour law. The essence is to help both parties better understand the implications of every action taken in the course of the relationship and help to better determine which of their legal action has a tendency to be successful when they eventually decide to approach the National Industrial Court for one form of remedy or the other. (a) A pure master/servant relationship under the common law. (b) Employment where the office is held at pleasure. (c) Employment protected by statute. The identification of the three types of employment listed by the court above is essential for employers and employees alike in view of the consequence that trails each type especially as it relates to termination of employment. The master-servant relationship is what happens when private or public companies offer employment to an individual. In such a situation, it is needless to say that the employer is the master while the employee is the servant. The implication of such relationship is that any day the employer no longer need the service of the employee, he can terminate the service of the employee and the courts have no power to compel the employer to keep the employee in service. This is captured in the well-established principle of law that a court cannot impose, in an ordinary contract of service, a willing servant on an unwilling master. See the case of Abdulraheem v. Olufeagba (2006) 17 NWLR (Pt.1008) pg.280. The only remedy the employee can get is damages if the employer fails to comply with the terms of the employment as it relates to giving notice to the employee or paying the employee salary in lieu of notice. “Where a contract of employment stipulates expressly that it is to be terminated by the giving of a stipulated period of notice, the damages recoverable for wrongful termination will be the amount of wages or salary the employee would have earned during the stipulated period.” Per OSEJI, J.C.A. (Pp. 60-61, paras. D-A). In order to avoid litigation, employers should endeavour to comply with the terms as stated in either the letter of employment or condition of service as it relates to termination. Also, if there are any terminal benefits that ought to be paid, the employer should endeavour to pay same. The employer should note that in the letter of termination, it need not state the reason why the employment is terminated. It suffices to simply state that “Your services are no longer required”. Employees who may intend to challenge a termination should be certain that the employer has breached the term in connection to notice and procedure stated in the terms of employment, else, such employee would be wasting his hard earned money on litigation if the employer has no fault in the process of termination. With regards to employment where the office is held at pleasure, this employment happens for mostly political office holders, for instance, special advisers to the President of the Federal Republic of Nigeria. The phrase ‘at the pleasure’ means that at any time, the employer/appointer can say he no longer needs the service of the employee without notice. It also means that once the appointer is no longer in office, the employment is automatically terminated. See section 151 of the 1999 CFRN (as amended). The third category which is employment protected by the statute is the most secured form of employment in Nigeria. The rationale behind that security is the fact that the employer is an abstract being unlike in the master/servant relationship. In this situation, the employer is created by law and the relationship between the employer and employee is also regulated by the same statute especially as it concerns the termination of the employment. It must be reckoned that it is not every employment in a Federal Government agency that is clothed with statutory flavour. Therefore, an employee working for a federal government agency should not be under such illusion of having a protected employment if the statute creating his employer does not clearly have provisions relating to the protection of his employment. See the cases of Central Bank of Nigeria v. Igwilo (2007) 14 NWLR (Pt.1054) 386 @ 393; Olaniyan v. University of Lagos (1985) 2 NWLR (Pt.9) 597 and Shita-Bey v. FCSC (1981) 1 SC 40. For the employees whose employment are protected by the statute, the employers cannot terminate their employment without reason nor without compliance with the procedure stipulated in the law guiding the relationship. In this form of employment, where the employees’ service is abruptly terminated without compliance with the requisite procedure, the court can force the employee on the employer by way of reinstatement and also order the payment of salaries for the periods when the employee was illegally put out of service. This means he will be paid for periods he didn’t work due to the fault of the employer. See generally the cases of Dr. Taiwo Oloruntoba-Oju & Ors. v. Prof. Shuaib O. Abdul-Raheem & Ors. (2009) 13 NWLR Pt.1157 Pg.83 and Bamgboye v. University of Ilorin (1999) 10 NWLR Pt.622 Pg.290. There are cases within this third category that have lasted for two to three years and ended in favour of the Claimant. The implication being that the Claimant earns salaries for three years without being productive. Although one can consider the trauma that the Claimant is made to go through during the protracted litigation, but the point is, all that could be avoided on the part of the employer and employee if only the employer simply ensures that the proper procedures as stipulated in the laws governing the relationship is complied with in the termination of such employment. It should also be noted that in the case of employment with statutory flavour, the court can declare a termination that fails to comply with the statute as null and void. Such pronouncement cannot be made in the case of master-servant employment. In such an instance, the court will merely declare the termination as wrongful. The difference between the two is that the former enables the court to order reinstatement while the later merely gives the court power to award damages without reinstatement. See the case of ESIEVWORE vs. NEPA (2002) FWLR (Pt. 124) 398 at 408. Depending on the type of employment, it is ideal for employers to issue to employees clear terms of the employment relationship. The employees should also endeavour to obtain and keep their original copies so as make the prove of their case easier when the need arises. The essence of the caution is that the terms of employment are the document that will mostly assist the court in determining the legal right and obligations of either party when a dispute arises especially when there is an allegation of wrongful termination of employment. In the case of a master-servant relationship, the terms may merely be written in the letter of employment and it may in addition to that, extend into a condition of service. Under the Nigerian labour law, in the case of employment with statutory flavour, it may be a combination of the letter of employment, the statute creating the organization, condition of service along with the Public Service Rules which applies to all civil servants. “It is well stated in many authorities that a condition of service is the bed rock upon which an aggrieved employee must found his case. Therefore in a matter of contract of service, the court will not look outside the terms as stipulated or agreed to therein to decide the rights of the parties. KATTO v. CBN (1999) 5 NWLR PT. 607, 390.” Per SHOREMI, J.C.A (P. 25, paras. A-B). A similar position is held with regards to terms of employment. See the case of ANIFOWOSHE v. WEMA BANK PLC (2015) LPELR-24811(CA). The essence of this position of the law is that employers and employees should know that they cannot ask the court to enforce what is outside the terms and conditions that they have both agreed to. Summary dismissal is one of the ways an employer can bring to an end the employment relationship with an employee. It is called summary dismissal because the employer will dispense with the need to give notice to the employee. It usually depends on the employee committing certain breach or misconduct which the employer must have outlined as bearing the consequence of a summary dismissal or an act that is criminal in nature. In most cases, when there is summary dismissal, the employee may be denied terminal benefit and the reason for his dismissal may be stated in the letter which has the capacity of denting the employees’ chances of securing another job. In view of the nature of summary dismissal, employees should know the position of the law in relation to same so that they don’t suffer the backlash of damages where it is found that the employee was wronged in the process. With regards to summary dismissal in a master-servant relationship, it is noteworthy for the employer to ensure compliance with the rules of natural justice and fair hearing. Failure to reckon same in the process will render the summary dismissal as wrongful. The opportunity of being heard could be as simple as issuing a query for the employee to answer to an allegation of the breach. He should also be given adequate time to provide the answer. In view of the foregoing position of the law, an employee that fails to properly carry out a summary dismissal will be made to pay damages to the employee. Nigerian Labour law – Employment law in Nigeria, what next? 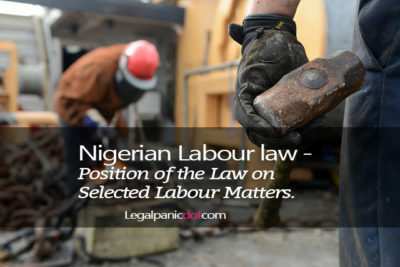 Having captured three sensitive issues as they relate to employment relation under the Nigerian labour regime and Nigerian Labour Law, one would hope that the highlighted positions of the law as reckoned above would assist employers and employees to better understand their relationship, foster better work environment and minimize the need for litigation. Written by: G.A. Bello, LL.M, BL.